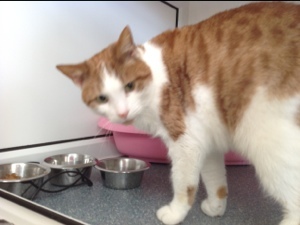 Hello all, my name is Ginge and I’m a neutered 3-year-old who was spotted living as stray in January 2013. I’m a fairly big lad with a totally charming manner. My carers here had hoped my lovely personality would get me an everlasting home very quickly but unfortunately I had a bit of a problem in the ‘cleanliness department’. They gave me the largest cage but I continued to make a mess of it. I’d been a stray for so long that it was hard for me to be trained to use a litter tray. My carers tried all sorts of tactics but eventually had to accept it was just not happening. I really couldn’t get the hang of it. They explained this to anyone interested in adopting me (i.e. that I would need an area indoors where this would be ok until I could be let out) and I nearly got a home in mid June but alas the people never actually came to adopt me. It would have been ideal as well by the sounds of it. Finally, my carers decided to tell me that my toileting trial was well and truly not going to plan and all their efforts had failed. I wish I could have understood what they wanted but despite trying I couldn’t, so, they let me have my freedom and become a resident. I was so scared when they took me out of the cage that I cried to get back in it! but they just said “No such luck Ginge!” so I had to venture out. My heart was beating fast, there was a lot to explore and loads of other cats and people around but, overnight I got myself accustomed to life here and managed to understand the pecking order of who’s who here. There’s been no trouble and I’m happy to say I’m thoroughly enjoying my life as a resident. No-one was sure sure how Fizz and I would cope with our first summer fair at the rescue in July 2013 but we both loved it! 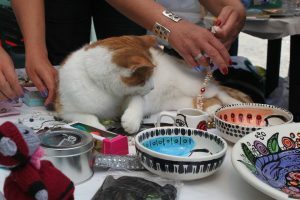 I spent most of the day at one particular stall getting hours of cuddles & strokes in the lap of one of the volunteer stall holders. I thought I’d better earn my keep so I got up onto the stall at one point to ‘give jewellery advice’ to a buyer. They bought the jewellery so I must have done ok eh? !